Three male offenders attempted to rob an 11-year-old boy of his bike in Northampton before one of them hit him with a metal pole. The victim was approached by three male offenders as he was riding his bike on a path that leads from Woodvale Primary Academy towards East Butterfield Court in Goldings, some time between 3.30pm and 3.45pm last Thursday (January 18), Northamptonshire Police today revealed. 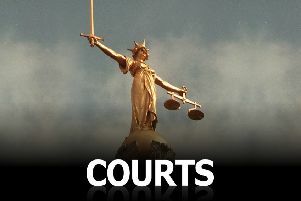 One of the offenders told the victim to "get off your bike" before striking him in the leg with a metal pole causing bruising to the victim who then cycled off. A spokeswoman for Northamptonshire Police said: "The first offender was aged about 13, 4ft 9in and was wearing a yellow puffa jacket, blue jeans and a black Adidas baseball cap. "The second offender was 5ft 2in and wore a yellow puffa jacket, white T-shirt and blue jeans while the third offender was 5ft 2 in and wore a black T-shirt, dark jogging bottoms and a zipped black jacket. "All were carrying metal poles and all had Irish accents."